A laugh-out-loud comedy about the realities of pregnancy, love, friendship and psychology. All is going according to the plan, UNTIL... is it possible? She’s pregnant right after her honeymoon! But, that’s not part of the plan. There are so many more things that are supposed to happen before babies. Are her dreams to start a private practice or Nolan’s dream to work for the Philadelphia Flyers crushed? When Jess finally accepts the obvious, she starts to unravel. Hold on for a wild ride through Jess’ brilliant yet quirky mind as she obsesses about all things pregnancy - morning sickness, weight gain, proper nutrition, kegels, home baby-proofing, pure exhaustion and honing her sexiness (let’s just say it gets a bit awkward). Along the way Jess’s zany patients, friends, family members and colleagues, manage in ways, both big and small, to contribute to her pregnancy fixations. Does her obsession turn her into “psycho-mommy”? 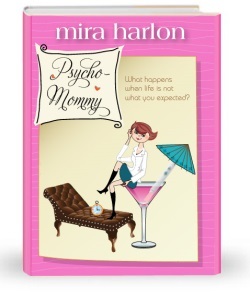 With incredible wit and amazing perception into the human psyche, Mira Harlon keeps you coming back for more. This ironic, feel-good read will have you laughing and crying and wondering if we don’t all have a little psycho-mommy in us! I had such a fun time answering these questions. I have a feeling if we ever went out for tea and cupcakes we would have a world of topics to discuss and probably have one to many cupcakes in the process! 1) Could you tell us a bit about Psycho-Mommy? Yes, of course! Psycho-Mommy is a story I came up with out of my own obsession with pregnancy. There are so many things to know and I remember feeling so uneducated. How was it possible that my mother, my grandmother, my aunts, or some elderly neighbour never took me aside and dished me the deal on pregnancy? I mean talk about clueless! That thought lingered with me over time as I made it to my second pregnancy and beyond. So, I decided to write a fictional book about that concept. Psycho-mommy is about a young psychologist who finds out she is suddenly pregnant after a few months of marriage. She is in total denial. She is used to being in total control of everything in her life, including finding peace and recovery for her patients. But, pregnancy is something she can’t control and knows nothing about. The book takes the reader on a wild ride through Jess’s day-to-day life as she starts to unravel trying to cope with pregnancy. She becomes rattled with her obsessions and instead of being the doctor she starts to become the patient. As a reader, I think you feel her struggles, her awkwardness, her emotions and you can’t help but laugh at it all. Her friends and loved ones try to support her journey but she is relentless. Along the way we meet so many zany characters that you feel like you’re in a girly version of a Seinfeld episode. Without giving too much more away, I will just say there are a lot of surprises too! 2) What is your favourite part of the book? Wow! That’s a tough question. I love every part of the book. If I had to pick just one part I think it would be when Jess is about to find out will she be the mother to a girl or a boy. I don’t want to give it away, but that chapter, I felt, brought so many emotions into play … the love … the friendships … the zaniness … the drama… and it culminated into this perfect storm of calamity and peace! 3) Any plans for Psycho-Mommy to return? Yes, I have about 5 more books in my head for psycho-mommy, but just not enough time to write them all. I am currently writing the second installment to the first book and enjoying myself quite a bit. I can’t wait to share it with you! 4) I would love to see Psycho-Mommy the movie, who could you picture playing the characters? What a fun question. I would love to turn Psycho-mommy into a movie. I would star Emma Stone as Jess, Karl Urban as Nolan, Mindy Kaling as Simmi, Neil Patrick Harris as Richard and Jane Lynch as Captain Crunch. Oh boy this is really fun! I could keep going, but maybe I shouldn’t get to crazy (or should I say psycho)! If it becomes a movie (which would be a huge dream come true) we will have to revisit this. 5) Here at 23 Review Street, I/We love cupcakes, what is your favourite cupcake? Oh my gosh! I have to pick just one? Hmmm … OK, I once had a red velvet and cheesecake marbled cupcake with this decadent butter cream icing. Cheesecake is my favourite dessert. So to take cheesecake, mix it with red velvet and make it a cupcake … whoever came up with that is a genius! Also, with the blog tour starting Today (Friday, 14th June 2013), Psycho-Mommy will be offered for 99 cents for 7 days starting today and ending next Friday. After this 7 day period the price of Psycho-Mommy will go up by 500%. I hope everyone enjoys Psycho-Mommy as much as I did, it is one of the best book I have read this year and I can't wait for the next installment in the Psycho-Mommy series. Thank you to Mira Harlon for a copy of her new novel and also for be involved in the Q&A with me at 23reviewstreet.